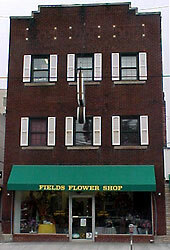 If you're ever in our neighborhood, visit our store at 1516 Central Avenue in Ashland, Kentucky. Our store hours are Monday through Friday 8 am to 5 pm, Saturday from 8 am to 12 pm, and closed on Sunday. You can reach us by phone at 800-233-3826 or locally at 606-324-2184. Unlike a lot of companies online claiming to be "florists" that are really a room full of phones, we're a real florist. We truly take time to create a product that is exactly what you're looking for. When you order a product from our site, but have a few ideas of your own, share them with us! We welcome your opinion; that's why we make it easy to include with our "Special Instructions for the Designer" portion of our order form. For example, if you'd prefer more pink flowers in an arrangement than is shown in the photos, let us know. We'll do everything we can to make your order fit to your personal style and needs. Our store... visit us anytime you're in the neighborhood!